The myth that SA renewables are responsible for their high electricity prices keeps on keeping on. So here’s another reason why it should be debunked. There’s a big myth going around South Australia’s renewable energy resources – surprise, surprise – and how they are supposedly responsible for the state having the highest wholesale electricity prices in the country. We’ve addressed this issue on numerous occasions, along with a bunch of other myths, and cited this 2005 report from the local network operator just recently which explained why it was that South Australia has always had more expensive wholesale electricity prices than other states. But given that the myth retains currency in many quarters, is being erroneously and shamelessly repeated by federal energy minister Josh Frydenberg, and is likely an issue in the upcoming state election, we thought it worth having another go. This graph above – courtesy of Simon Holmes a Court from the Climate and Energy College in Melbourne – is a good an illustration as any of how this myth should be debunked. 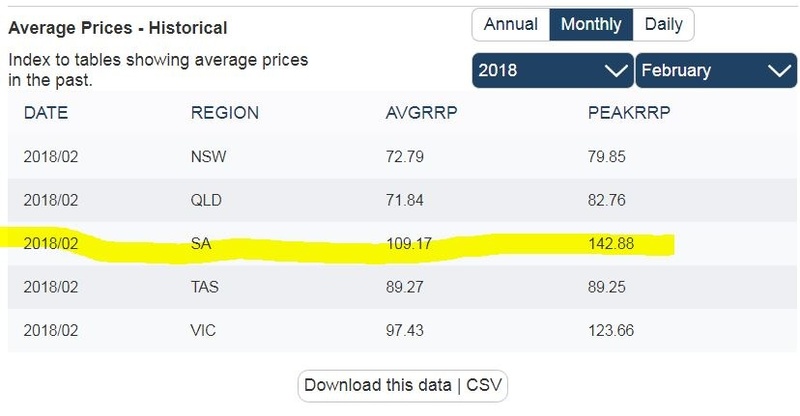 It shows that going back to the turn of the century, the premium of South Australia’s electricity prices over other states was huge – the victim, as the utility ETSA pointed out, of its unique position in the market, its weather patterns, and the dominance of a few big players in the local grid. That premium has persisted ever since, interrupted only by coal-heavy Queensland in 2015, before that state’s Labor government instructed the government-owned generators to change their bidding and forego revenue to keep prices down ahead of the recent state election. 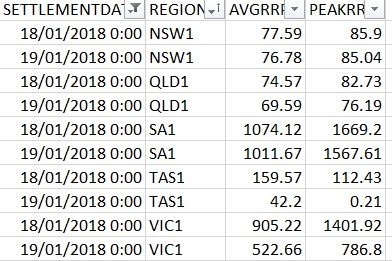 Of course, Frydenberg has also been banging on about the lack of reliability in the South Australia grid, but over the last 12 months, since the Australian Energy Market Operator pulled its socks up, there have been no issues – and those that preceded it had nothing to do with the nature of wind energy. Which goes to show that there is nothing scary about a grid with 50 per cent wind and solar, and indeed – as more energy storage is installed, and more facilities become “dispatchable”, the fossil fuel industry’s stranglehold over electricity prices can finally be broken. The Tesla big battery next to the Hornsdale wind farm has already show how that can be done, smashing the gas cartel’s control over the FCAS market. As more storage is built – and there is plenty under construction and in the pipeline – prices will come down in wholesale markets too. Regulator pushes for household battery storage register to remove "blind spot"
Right now the problem of increased penetration of renewables is not technical its political. It is difficult to get the message across in 30 sec. sound bites. When I start discussing this with most of my friends they glaze over and say “don’t bother us with all that technical stuff”. The sound bite “high energy prices are caused by renewables” seems to stick however. I have been responding with “i am a power systems engineer and that statement is utter crap” works occasionally anyone got better ideas? I find going to the extreme with silly examples highlights the error of their thinking. Something like “yes, renewables have caused high power prices, and high tides. We’re going to be swamped by seawater because of renewables”. Makes as much sense. High energy prices are caused by poles & wires and gas? That’s a good one. I can’t use it because I’m not a power engineer. For people who don’t know the word “cartel”, I say “monopoly” or “conspiracy”. “My last power bill was $80 thanks to my solar panels” gets the attention of people I wasn’t even talking to. Why does anyone in SA stay on the grid. It is cheaper to run a diesel. Even cheaper to use solar and a battery. The SA grid is dead but still kicking. How can grid scale wind and solar ever hope to compete with rooftop solar when there is no economy of scale but grid scale is saddled with 120% extra cost for transmission. The minimum demand in September 2022 in SA will be zero. That will be a very difficult grid to stabilise – get off now and save money. AEMO forecast 2024 for zero minimum demand but it will happen sooner than that as industry shuts up shop or switches to their own generation. What prices are customers paying at the retail end? I guess that’s what should be compared. In Victoria I understand prices are half that of South Australia. If I divide the Invoice Charge inc GST by the kWh used, a mix of Peak / Off peak + Service Charge, mine comes to $0.235 per kWh. 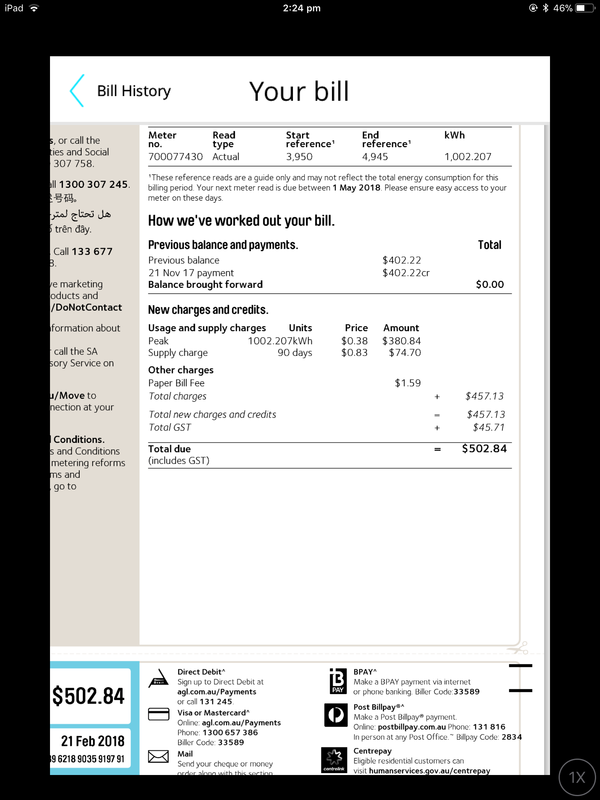 If I add the Pensioner Discounts it’s $0.154 per kWh inc GST. Highlights the shallow retailer pool here in S.A., doesn’t it? Ours is a bundled electricity + gas plan, and has been (just) the best on offer over the last five years, for our consumption. A quick look at AGL’s Victorian (metro.) tariff indicates $0.27 / kWh, but a considerably higher daily supply charge than ours. It’s very difficult to compare prices for the average consumer. That’s why its easy to divide the invoice price by kWh used to see actuals costs. Doesn’t make it easier to compare all the various resellers and plans though. I’m looking at Diamond who have a 20c FiT (3 years) but only on the first 10kWh/day exported. There’s still a few weeks before the current AGL plan expires and I have to act. I last updated the sheet a couple of weeks ago, following receipt of AGL’s renewal offer (which of course is less favourable to us than the current plan). With the information publically available at the time, Simply Energy’s RAA Plus plan (18% discount, $0.61 FiT) would be best for us. However, AGL will be made aware of this, and given a chance to improve their offer, as there’s also a few minor reasons to stick with them (FiT credit refunds, FlyBuys, local call centre). Keep in mind our plan is bundled, so gas is also an input. Thanks, yes gas is another level of complexity. Thankfully I am all electric other than a bottle for the stove top. Amaysim now seem to be offering electricity in S.A., which I’m sure they weren’t doing this time last year. You might want to investigate their Solar 1 and Solar 2 plans – they show a reasonably good saving in my spreadsheet, given a $0.20 retailer FiT and a 28% or 33% discount on usage *and* supply. OK thanks, I’ll have a look. I use not much in NSW. I pay 55 cents a kwh. I could use a petrol generator cheaper. Harry, the same tariff and supply charge as us, but with no discount. Are you on a Standing Offer? Don’t let the truth get in the way of a good story, the Polies never do. glad you are finding OpenNEM useful. The issue is whats the spot price when renewables fall short and you need to get power from the cartels, see the example below for January 2018. What we need is a ceiling on the price and the bill to be worn by the State instead of spreading it around. The SA and VIC price for 18/19th Jan was as much as the month of January! Interesting information. I had a (very) quick look at openNEM but I couldn’t find the $cost breakdown. I could see the generation figures but not the breakdown you gave. As you say, it would be really useful to have this instantly available. You may need a pointer or mouse. Just hover over the gen type in the chart or anywhere on the list. Thanks. That explains it, I was using my tablet. We all sympathise. But the LNP are using SA as a distraction…we are all being Donald Ducked with high energy prices. The people need to act because the government will not. Talk to your government member. Those who can afford it, get PV and batteries. I have borrowed money and have PV and batteries and hope in a few years to get more…and then we can watch the foreign owned AGL, Energy Australia etc BURN in hell. Viva la Batterie, mort à AGL, EA. The chart also appears to show that privatisation has had little to do with high prices…..about time we debunked that myth too! Careful how you interpret the chart – it shows the premium over the spot price – not the actual price. In the short term you are correct but as with the carbon tax removal, it leads to a dearth of new investment. There is nothing in it for the cartel in SA to add more generation as they would be competing with themselves. AEMO have pulled their socks and HPR has been a success, but was the decision to buy the rental generators the best use of money? or will they be sold again?….. Why not just procure 8 more HPRs? If they end up playing in the market they are a bargain. If not, then an expensive insurance policy. I wonder what the resale value is on these? One owner, low mileage. You would think they would still have a lot of value. I’d be more than happy if they were sold to a new (to SA) Gentailer and were then free to compete. Maybe firming for one of the many RE projects.